In recent years, consumer demands for more nutritious salad products have brought major changes in the types of lettuce produced and in the methods of their cultivation. These changes have also brought new challenges to disease and pest management in lettuce production. 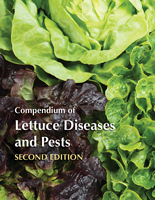 The new Compendium of Lettuce Diseases and Pests, Second Edition, addresses these changes and challenges by providing the most up-to-date and comprehensive resource available on lettuce diseases and pests, as well as their management. It offers solutions to help users identify and manage infectious diseases caused by fungi, bacteria, nematodes, viruses, as well as noninfectious disorders such as air pollution, allelopathy, bolting, mineral deficiencies, toxicities, pesticide related injury, rib blight, tipburn, and many others.